Howard Shore has just done a new interview with Classic FM that covers his work on The Lord of the Rings and the upcoming Hobbit films. It's not a lengthy piece, but there's some excellent insight included ... especially for those starving for a little Hobbit update! Last October, David Morgan did a terrific story on the Radio City performance of TTT for CBS News. Of course, when a story like this is created, there's always footage that doesn't make it to the final presentation. Today, Morgan posted his unused B-roll footage on YouTube, and I thought you might enjoy a look. This gives you a great sense of what it's like to be on-stage for one of these massive performances. Morgan's write-up from the YouTube page is below the video. This video is some of the B-roll I shot in October 2010 of Ludwig Wicki conducting the 21st Century Orchestra and Dessoff Symphonic Choir during rehearsals for the "Lord of the Rings: The Two Towers" concert, performed live to projection, at Radio City Music Hall in New York. The footage was for my video report posted on CBSNews.com. Last night's book-signing at Ravinia was fantastic; and, of course, the performance was magnificent. Tonight we get to do it all again ... though I may treat myself to a nap before heading back up to Highland Park. Remember I'll be at Ravinia Gifts from 6:45 to 7:20. I'd love to see you there! The article below is actually an older piece: it originally ran on July 26. However, I've only recently discovered it, and it's certainly a fine prelude to tonight's festivities. I always love reading write-ups from the performers' points-of-view. This piece originated right HERE, on the Chicago Chorale's official website. Enjoy! Thursday and Friday, August 18-19, Chicago Chorale will join forces with the Lakeside Singers, the Chicago Children’s Choir, and the Chicago Symphony Orchestra, under the baton of Ludwig Wicki, to perform the soundtrack in a showing of The Lord of the Rings: The Fellowship of the Rings at Ravinia Park. I fully expect that the park, and the pavilion, will fill to capacity both nights. Electronics being what they are, these days, it appears to be a matter of pressing a few keys, to eliminate the musical soundtrack, while leaving dialogue and all other elements of the soundscape intact, and replace it with live performance. Coordinating the live performance with the film, however, matching everything up frame by frame, is a daunting challenge. The conductor has presented this very program several times, with numerous orchestras and choruses; none of the rest of us have ever done it, however, and we will need to be on our toes at all times. The entire movie has only forty minutes of vocal music, but that vocal music occurs, here and there, in major scenes as well as in limited, eight-bar phrases, throughout the performance. The full score, which I am studying and which I will use in leading rehearsals, has all of the music for the entire film, and weighs about five pounds; the choral scores have only the voice parts, with no accompaniment and only minimal orchestral cueing. The singers must count bars for pages at a time, before suddenly entering , often at a forte, at the extremes of their vocal ranges, frequently at breakneck tempos. Meters constantly change, as do tempo markings; and the singers must perform in such languages as Orc and Elvish, which are written in the score in something similar to what a middle school student might use if he were asked to spell out street slang, rather than in IPA (International Phonetic Alphabet), which singers are trained to read. Adding insult to injury—the font seems intended to look like Elvish runes—very decorative, but not much good for speed reading! Vocal demands are tremendous. In such scenes as the Mines of Moria, the choir is divided into as many as twelve parts, with basses singing page after page of low D’s while the first sopranos hang out on high A’s and B’s, all at fortissimo levels. I have been watching the film, and listening to a recording of the sound track, in preparation for our first rehearsal (we begin Monday evening, August 1, and meet nearly every day up to the performances). In the past, when I have watched the film, I have not paid much attention to the music; I have known it is there, and have appreciated the skill with which it augments the viewing experience, but I have left it in the background—which after all is where it belongs. Now that I am studying it, I realize, more with each exposure, how brilliantly it has been composed, and how masterfully it has been woven into the total fabric of the experience. I have heard that the composer, Howard Shore, spent three full years composing and preparing the music for the three films in the trilogy, and I am not in the least surprised– in its way, his task has been fully as complicated and all-encompassing as Bach’s task in composing the St. Matthew Passion. This is magnificent stuff. I don’t think I need to promote the performance– people are very excited about it, and I just hope they are not turned away at the gates, after driving from all points in the Chicagoland area to attend the performances. Nonetheless, I urge you to look at your calendars for August 18-19; if you can come and hear it, I’m sure you will agree with me that this is a stunning accomplishment, for the orchestra, the choruses, and the conductor. And the movie isn’t bad, either. Howe Records will have a busy autumn. Next up after the September release of The Lord of the Rings Symphony will be Howard Shore's original score to Martin Scorsese's Hugo. No date is currently listed, but the film itself is due November 23. Harmonia Mundi, which distributes Howe Records, added their placeholder webpage for the album yesterday. Shore's music for Hugo will record later this year. 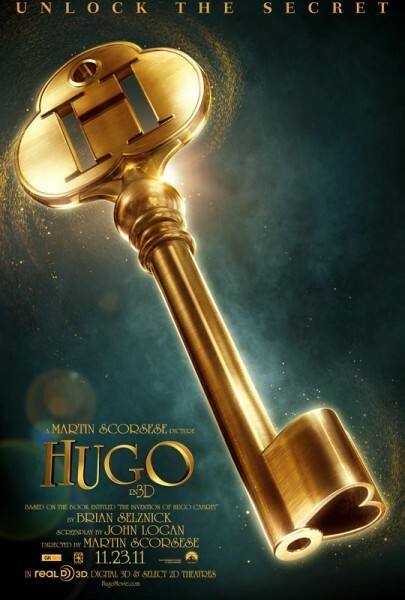 Learn more about Hugo HERE. Officially official! Also, the Complete Recordings will be back in stock in the coming months! See all below, and catch the original press release right HERE. This December marks the tenth anniversary of the cinematic release of The Lord of the Rings: The Fellowship of the Ring. There has been a resurgence of interest in Tolkien's works as fans celebrate and prepare for next year's release of The Hobbit. Sales of the coffee-table book The Music of the Lord of the Rings Films have been robust, and Warner Music will re-release each of the three Complete Recordings Series box sets in the coming months. In addition, a stadium tour of the Lord of the Rings Live-to-Projection concert will be mounted this fall in the United States. 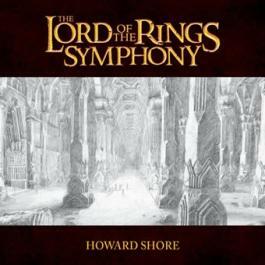 This month, Howe Records proudly presents the world première recording of Howard Shore's Lord of the Rings Symphony. The composer says of the project, "J.R.R. Tolkien's The Lord of the Rings is very close to my heart. I have great respect for his writing and share the values he weaves into these stories of courage and honor, friendship and sacrifice. I love the inner aspect of his writing, the detail of the relationships, and his observance of nature. The Lord of the Rings Symphony was created from the nearly twelve hours of music written for The Lord of the Rings films. Maestro John Mauceri first suggested I create this work from the film scores. We worked together to adapt the scores into the six movements that reflect each of the six books of J.R.R. Tolkien's The Lord of the Rings." The work is performed by The 21st Century Symphony Orchestra conducted by Ludwig Wicki, who personally selected the musicians who perform on this recording. Chicago, Tuesday, August 9, 2011. Fans of The Lord of the Rings series should start making plans for an epic quest through the forests and over the ravines of Chicago's North Shore to Highland Park for a special event featuring the film, The Lord of the Rings-The Fellowship of the Ring, accompanied by the Chicago Symphony Orchestra. The CSO, as part of their summer residency at Ravinia Festival, will conclude their summer season with two movie nights featuring the film and live music on Thursday, August 18 and Friday, August 19. For this momentous occasion, the Orchestra has moved their popular Friday Night at the Movies Series north to Highland Park. The beloved CSO movie series taps into the long history of symphonic music in the movies by using their full orchestra to play the score from selected movies while the movie is projected on a screen. Conductor Ludwig Wicki will be making his Ravinia debut performing the Oscar-winning score from The Lord of the Rings-The Fellowship of the Ring by Howard Shore accompanying the complete film. The movie will be projected on a giant video screen on the lawn and in the pavilion. The performances will also feature soprano Kaitly Lusk, alto Henry Griffin, The Lakeside Singers, Chicago Chorale and the Chicago Children's Choir. Tickets. Tickets are $50 for the pavilion; $25 lawn or $65 for a ticket and dining package. For more information or to purchase tickets, visit Ravinia.org or call the Ravinia Box Office at 847-266-5100. Kids under 15 as well as high school and college students with valid student I.D.s are free on the lawn at all classical concerts. Special Guest Chef. Ravinia’s guest chef series continues on the evenings of August 18 and 19 with Thomas Bowman, executive chef from iNG visiting the festival’s Park View restaurant. Reservations can be made, in advance, by calling 847-432-7550 or reserving a table online at Ravinia.org. Book signing. Prior to both performances author Doug Adams, who penned the book The Music of the Lord of the Rings, will participate in book-signings starting at 6:45P.m. in front of Ravinia Gifts. Time. The park opens at 5p.m. The performance begins at 7:30p.m. both evenings. Thursday, August 18 and Friday, August 19, 2011. Location. 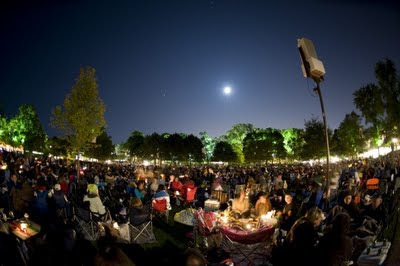 Ravinia Festival is located at Lake Cook and Green Bay roads in Highland Park, IL. Parking is available in the Ravinia parking lot adjacent to the park on Green Bay Rd. until full. Shuttles are provided from Metra parking lots at Ravinia and Highland Park. Public Transportation. Check the Metra north lines for trains stopping at Ravinia Park. Otherwise patrons can exit the train at the Braeside stop and walk north about 1/3 of a mile to the park. Conductor Ludwig Wicki fell in love with movie music when he heard the film scores of famed Italian composer Ennio Morricone. “I was 16 and after hearing his music, I became interested in film soundtracks,” said the Swiss conductor, when reached by telephone in his home town of Lucerne. After that he discovered another significant Italian Nino Rota, who composed for the movies of Federico Fellini and scored all Francis Ford Coppola’s “Godfather” films. Wicki will be on the podium at the Ravinia Festival pavilion for two nights Aug. 18 and 19, conducting the Chicago Symphony Orchestra in Howard Shore’s complete Academy Award winning score for “Lord of the Rings: The Fellowship of the Ring” while the three-hour film is being shown. 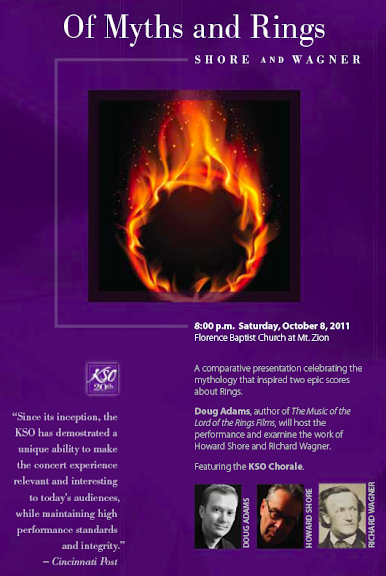 Choral parts will be performed by the Lakeside Singers, the Chicago Chorale and the Chicago Children’s Choir. Wicki first conducted that score in what is called live-to-projection in 2008 in Lucerne and since then has performed it 30 times. “I did it with my orchestra,” he said “the 21st Century Orchestra. It’s made up free lance musicians who love movies and movie music.” Since it was founded a decade ago, the orchestra had presented sold-out concerts of film scores throughout Europe, but only in 2008 did they venture to play a score live as a film was being show. Since then Wicki has given live-to-projection performances of the “Fellowship” score with the Munich Symphony, the Krakow Sinfonietta, the Wolf Trap Festival Orchestra, the St. Louis Symphony, Winnipeg Symphony, and now, the Chicago Symphony Orchestra at the Ravinia Festival. But how does a conductor coordinate the music of a live orchestra with the on-screen image? In the past Hollywood and every film studio recorded live music for their films with the aid of a click-track. The conductor synchronized his baton with a series of metronome-like audio cues coinciding with the moving image. Laterly, however, conductors, Wicki included, have been using a computer system with visual cues.”It utilizes a series of streamers, punches, and flashes, so I can keep the beat where it should be with the film,” he explained. Wicki’s career is not limited to film scores. He began as a trombone player and at some point he studied privately CSO trombonist Frank Crisafulli, at Northwestern University in Evanston. For nine years he was a member of the Lucerne Symphony and Opera Orchestra. The North American debut of his “Fellowship” score live to projection was given in April 2008 by the Winnipeg Symphony Orchestra, under the baton of one of his biggest fans. You guessed it — Ludwig Wicki. Great stuff! Please be sure to click over to the original articles as well. ... And Ludwig, if you're reading this, we can't wait to see you and Beatrice next week! I'm still holding on to an exciting announcement that ought to revealed later this month, though it's already leaked in some quieter corners of the internet. If you're really dedicated, you may be able to track it down. No, that's not a challenge! But it's now well into August, and high-time we get the new Discussion Board up and running. Happily, Ravinia has just announced its new three-part contest, so we have something great to hang a new thread on! In celebration of the Chicago Symphony Orchestra's presentation of The Lord of the Rings: The Fellowship of the Ring on Aug. 18 and Aug. 19, Ravinia presents a caption contest! Check back every few days for a new photo to comment on! The person who submits the funniest/most imaginative caption will receive a prize package from Ravinia. One GRAND PRIZE winner will receive two (2) pavilion tickets and a Blu-Ray Box Set of the Trilogy, in addition to the prize package. 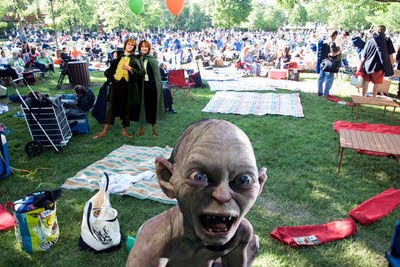 ENTER BY TWITTER OR EMAIL: Tweet your submission by using a hash-tag of #RFLOTR1 or email us your submission to twitter@ravinia.org with subject "LOTR Caption 1" or by clicking here. ALL EMAIL SUBMISSIONS MUST BE 135 CHARACTERS OR LESS. If your Tweet does not appear within about one hour, check your spelling of the #RFLOTR1 tag, and make sure that your tweets are not set to private. If your email submission does not appear within 24 hours, double check the email address. If your email submission is rejected, you will receive an email explaining why. GOOD LUCK. And may the force be with you…oh wait, that’s something else. The first caption-able picture is, of course, above. Be sure to visit the official Ravinia LOTR Contest Site in order to keep up with the latest. And don't forget that I'll be signing The Music of the Lord of the Rings Films at 6:45 p.m. before the concerts on both the 18th and the 19th. Look for me in Ravinia Gifts, the official gift shop. I'll also be in attendance at the performances both nights as well (no sign-and-dash for me! ), so come say "hello!" I'm no Groupon expert, so I'm hardly qualified to parse the following ... but it sounds like there's a good deal to be had! If you're still on the Ravinia fence, maybe this will tip you over. Anyway, it appears you can follow in the hallowed footsteps of Fruffy the dancing bear, so what's not to love? See more HERE. And if you're in the area, please stop by to say "hello." Even if you already own the book, it would be nice to put some faces with names. -For $25, you get to attend a screening of Lord of the Rings: The Fellowship of the Ring with live symphonic accompaniment on Thursday, August 18, at 7:30 p.m. (a $50 value). -For $25, you get to attend a screening of Lord of the Rings: The Fellowship of the Ring with live symphonic accompaniment on Friday, August 19, at 7:30 p.m. (a $50 value). The internationally renowned Chicago Symphony Orchestra takes its mighty sound into the great outdoors for a series of concerts at the Ravinia Festival's open-air pavilion. On August 18 and 19, the symphony will perform the Oscar-winning score to Peter Jackson's adaptation of Lord of the Rings: The Fellowship of the Ring, which will be screened on a giant piece of toast on the venue’s lawn. Violins swoon and timpani bellow as eyes follow hobbit heroes through the dramatic landscapes of Middle-earth. Voices from the Lakeside Singers and Chicago Children's Choir will swathe climactic scenes in ethereal splendor, summoning goose bumps and angel halos that double as glowsticks. Fans who arrive early (6:45 p.m.) can stop by Ravinia Gifts to meet Doug Adams, author of The Music of The Lord of the Rings, or search for elven enclaves in mountains of Carousel ice cream. On September 9–10, Momix: Botanica will toss pavilion visitors into a vortex of visual illusions and nature-themed dance parables. Guests can marvel as performers channel the artistic energy of theatrical-movement troupes such as Pilobolus, then use that energy to forge surreal expressions of beauty and recharge spent computer batteries. Founded as an amusement park to lure riders to the Chicago and Milwaukee Electric Railroad, Ravinia has entertained thousands of fun-seekers since 1904. As one of the oldest outdoor music events in North America, the Ravinia Festival has welcomed numerous luminaries to its stages, including jazz legend Louis Armstrong, opera star Luciano Pavarotti, and Herbert Hoover’s dancing bear, Fruffy.